There is no routine cancer, especially when you or a loved one hears those life-changing words: "You have cancer." This is why it's vital to have an entire team on your side. Research shows that patients have better outcomes when treated at National Cancer Institute (NCI)-designated comprehensive cancer centers that see larger numbers of patients, conduct state-of-the-art research, have physicians who specialize in specific types of cancer and offer a wide range of clinical trials. One way to explain the components—and members—of the team approach is through a couple of examples at The Ohio State University Comprehensive Cancer Center — James Cancer Hospital and Solove Research Institute (OSUCCC — James). The Multidisciplinary Prostate Cancer Clinic gives newly diagnosed patients an opportunity to meet with experts who are subspecialized in prostate cancer from urologic radiation oncology, surgical oncology and medical oncology—all on the same day, in one location. Together, a patient and his team decide on the best and most personalized treatment option. At the Stefanie Spielman Comprehensive Breast Center, the team includes breast cancer subspecialists in medical oncology, surgical oncology, radiation oncology, imaging and breast reconstruction. Team members meet with a patient and family to formulate an individualized, comprehensive treatment plan. Other members of the team include: nurses and nurse practitioners, psychologists, social workers and physical therapists who specialize in treating cancer patients. 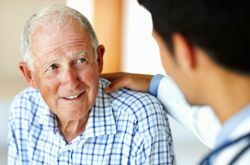 Some cancer centers also have financial counselors, expressive therapies (such as music and art therapy), survivorship clinics and palliative care clinics. The family and friends who provide caregiver support are also important as patients go through their cancer journey. Having a research component on your team is important. Advances in genomic testing allow physicians and researchers to examine tumors at the molecular level and recommend targeted treatments or clinical trials that lead to better outcomes, fewer side effects and more hope. "We are constantly thinking: How can we get our research and the work of others from the labs to our clinics, so our patients have another chance in this fight?" says Michael A. Caligiuri, MD, the JL Marakas Nationwide Insurance Enterprise Foundation Chair of Cancer Research at the OSUCCC — James. The team approach is paying dividends and saving lives. The five-year survival rate among patients treated at the nation's 11 freestanding comprehensive cancer centers (including the OSUCCC — James) is 53 percent, according to a recent study by Memorial Sloan Kettering Cancer Center in New York City. The 11 are all NCI-designated comprehensive cancer centers. The study looked at about 750,000 cancer patients at the four types of hospitals that treat cancer patients. The survival rate was 49 percent at the 32 NCI-designated comprehensive cancer centers that were part of the study and are not freestanding cancer centers, 46 percent at the 252 other academic teaching hospitals, and 44 percent at the 4,873 "remaining hospitals," including community hospitals. 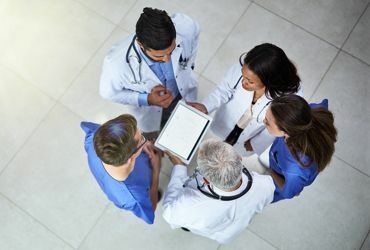 The Sloan Kettering study found that the freestanding and other comprehensive cancer centers have better outcomes because "interdisciplinary teams work together" and there is "access to the newest therapies." "We have amazing teamwork," Caligiuri says. "And now, when someone hears the words, ‘You have cancer,' we can say to them, 'We can help you.'" Visit the OSUCCC — James to learn more about the importance of a cancer care team.